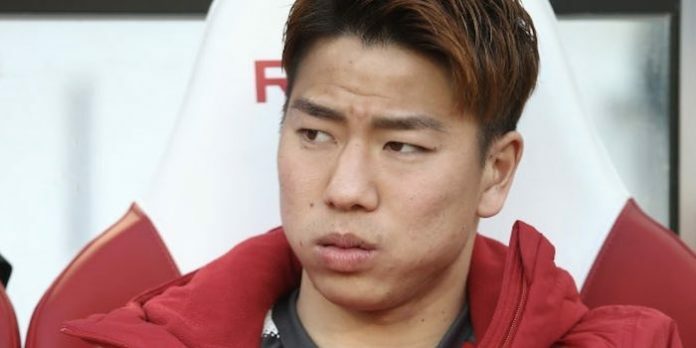 It’s loooking increasingly likely that Takuma Asano will leave Arsenal without kicking a ball in anger for us. The Japan international was signed out of the blue from Sanfrecce Hiroshima for £5 million in July 2016 and pitched by Arsene Wenger as ‘one for the future’. Unable to secure a work permit in the UK, he was immediately sent on loan to Stuttgart, then playing in Germany’s second tier, to adapt to the speed of European football. An initial one-season spell, in which he achieved promotion to the Bundesliga, was followed by a second at the Mercedes Benz Arena. In May he moved to Hannover 96. It’s fair to say Asano hasn’t set the world on fire this season, however, he’s still made a respectable 14 appearances at the HDI Arena. The quandary for Hannover is that they will have to buy the 24-year-old for €3 million if he makes two more appearances in their remaining eight games of the season. “That’s the principle,” confirmed director Martin Kind. There seems to be a split in opinion as to whether the deal is worthwhile. While there’s an acceptance that he has pace and potential, the fact he’s not registered a goal or assist in the league is a major worry. Especially as he’s mostly featuring as a second striker. If Hannover bench Asano for the rest of the season, it could provide Arsenal with a minor headache. It’s clear he doesn’t have a future at the Emirates so we’ll have to sell him elsewhere this summer before he enters the final year of his contract. Very likely that Hannover is going down to second tier, having less money therefore bench him even tho every body might be crucial for them in the following games. Saw him a couple of times in the J-League and was kinda excited but also saw some games of him in Stuttgart and few “Highlights” in Hannover and it is fair to say he didn’t set the world on fire. Anyway, good luck Tiger! We’ve been taking small punts on certain wildcard players. Joel Campbell was one. At 5m Asano is a slightly more expensive bet. Hasn’t worked out. Not a big deal. Hopefully easier to move along then Jenkinson and Elneny have been. No takers for these two. Says everything about their quality. Why the panic to sell him before his contract runs down? He only cost £5 million we throw away a lot more than that normally! Another organisational blunder from the previous administration? We gambled a few mill on a young player who apparently had potential. We lost. Happens all the time to every big club. If we can get 3mill back, great. I don’t mind investing in potential talent and finding out after a few seasons the player doesn’t really live up to expectation but this guy couldn’t get a work permit so he couldn’t even play for us. That’s a key point here. We certainly do throw away a lot more than that normally – which is one reason why Emery is probably going to have around £40 million in the Summer. Sometimes you have to take a gamble of course, but we’re increasingly shopping in the bargain basement nowadays so even the odd £5 million here and there on an Asano will begin to eat into limited resources. Or aimed at marketing in Japan? Hannover are going to have a very warm bench!!!! I think the First Team administrators whoever that may be ought to put their head round the door of the Women’s Team Manager’s office. He is busy extending the contracts of influential players who only signed a deal last season which straight away boosts the morale of the players and avoids the expiring contracts situation that the men keep finding themselves in. During the Wenger era, the inability to get players re-signed – or sold – as they entered the penultimate year of their existing contract cost Arsenal a fortune in potential transfer fees over the years. The good news is that the new backroom team have acknowledged this and that it won’t be allowed to happen in the future. I hope the German team Hannover the cash quickly. Providing more proof that wengers time was up. The man is a legend and woukd rename a street by the stadium with a statue in his honour. You have to speculate to accumulate as they say, and all clubs do this, but Asano is far from the first youngster that Wenger bought and who then just “disappeared” into Europe. People get far too carried away with possibilities around young players – we’re seeing the same thing in the press about the so-called “wonderkid”, Gabriel Martinelli, who is linked with us. In the end, hardly any ever make it as a first team regular. It’s fine to take a calculated gamble from time to time, but let’s not get carried away with the hype. Wish they had taken a bit of a gamble and bid more than the Plus £1 for Suarez. I’m glad we didn’t get Suarez. He would have carried on causing a nuisance until he got his Barcelona move. Notice how there hasn’t been a single controversy around him since then. Possibly, but we would have made a huge profit on the transfer to Barca if/when it happened and it’s likely he would have scored quite a few goals in the interim. There is never reason to bid above someone’s release clause. Arsenal would have been completely daft to have bid any higher. John Henry admitted a year or so after it all happened that Suarez had a release clause for offers over £40m, so Liverpool were contractually obliged to accept Arsenal’s bid of £40m +1 (if Suarez wanted to leave). The reason Suarez didn’t join us is he didn’t want to. He said earlier this year that Gerrard persuaded him to turn down Arsenal. And he slipped and cost them the title.